Nigeria is considered a keystone state in Africa, home to approximately 140 million people (2006) or about one fifth of Africa’s population. As with many African countries, Nigeria is resource rich – blessed with an abundance of natural resources including oil and gas – yet two thirds of the population lives in poverty. Issues of poverty are fundamentally tied to questions of the environment as a vast majority of the population depends on natural resources for their livelihoods and day- to-day subsistence. Nigeria has lost an estimated 90% of its original forest cover, with more than half the remaining forest found in Cross River State . Cross River State’s forests are also of global importance as a designated biodiversity hotspot, supporting one of the greatest concentrations of plant and animal life in Africa. Cross River is also home to a large – and growing – population of forest-based communities that score poorly in terms of human well-being, a government increasingly open to dialogue with civil society and an environmental movement with varying levels of capacity that had emerged in the 1990s. Cross River State was identified as one of CIDA’s two focal states in Nigeria. CIDA aimed to work in partnership with government and civil society in Cross River State, and to support effective strategies to improve natural resource dependent livelihoods in rural areas. In response to this situation, and after several missions to Cross River State, One Sky submitted an unsolicited proposal to CIDA in May 2002. CIDA approved the proposal and a Contribution Agreement was signed between CIDA and One Sky – Canadian Institute of Sustainable Living. One Sky, a Non-Governmental Organization, was the Canadian Executing Agency (CEA) of the Cross River Environment Capacity Development (CRE) project. During a planning phase from January – July 2003 the CRE Project Implementation Plan (PIP) was developed collaboratively with Nigerian and Canadian organizations, and submitted to CIDA; the PIP was approved on July 2, 2003. The $2 million CRE project was implemented over four years from July 2003 – March 2007. The CRE Project brought together a coalition of four Nigerian ENGOs (DIN, LENF, NCF and CERCOPAN) and one environmental network (NGOCE) as the primary beneficiaries; secondary beneficiaries were Community Based Organizations (CBOs) and tertiary beneficiaries were the communities within which the ENGOs and CBOs operate. The goal of the CRE Project was to strengthen NGO capacity to affect gender-sensitive policy change and environmental improvement in Cross River State. Its purpose was to build a network of long-term partnerships among Canadian and Nigerian environmental organizations that will work together to strengthen organizational capacity and environmental management. The project approach was to strengthen the capacity of four environmental NGOs (ENGOs) and one environmental network. 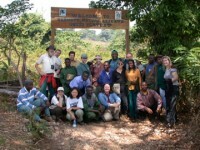 Stronger ENGOs would in turn be better able to support CBOs and communities to affect policy change and environmental improvement in the buffer zones of the two surrounding key protected areas – the Guinean Lowland Forest Ecosystem in Cross River National Park as well as the Montane Ecosystem of the Obudu Plateau – in the Cross River bioregion of Nigeria. After four years of working together, the ENGOs in the CRE Coalition are stronger in a variety of areas. They are more effective at working with communities to protect the environment and address local development needs, are more strategic and show a higher degree of sophistication iin policy dialogue activities, are better able to integrate HIV/AIDS into programming as well as mainstreaming gender, and display stonger organizational capacity in a variety of areas including the ability to work in collaborative efforts. For more information, please review the CRE Project Final Report - Executive Summary. Click here for photos from the Cross River Environment Project.